The Audacity of SHE — It’s Anahita! I just love connecting with women who empower other women…which can be done in multiple ways. One incredible woman that I met about a year & a half ago who has an incredibly (impactful and inspiring story) has created a platform that embraces women’s journeys, their boldness in everyday life, and inspires them to build their dreams no matter what that looks like. From her Podcast “The Audacity of She,” to her Event Productions, to her collaborative projects….plus I’d like to personally add a bonus: Air bnb host + leader in self-care and yoga practice….this lady is a leading example of determination, perseverance, and genuinely uplifting others. Even in her fun posts about upgrading her rental property is a joy to watch! Even that’s not an easy task, but her candid posts on social media and her vulnerable & humorous narratives hone in on the values Dana has. Plus she’s incredibly KIND! What inspired the start of The Audacity of She? I’ve seen so many women who are on fire, and also so many who are unhappy. A secret that I realized is that none of us ever feels like the time is right to do the things we dream of, some of us just decide to do it anyways! So I created The Audacity of She to shine a light on what dream building actually looks like. I use The Audacity of She to share my process of bringing my dreams to life. And by doing it, I’d love to inspire and educate others along the way! Can you share a moment or an obstacle you faced in your personal/professional journey that was challenging or felt deflating? How did you overcome that? Well, professionally there are tons of ups and downs and I’m always exploring new territory, so I’d say developing a thick skin has helped me. So much of what I take on doesn’t turn out the way I expected! Personally, being a young mom was super hard. I graduated high school 2 weeks before giving birth to my daughter and those early years were pretty tough. But I decided not to let my circumstances define me, and I’ve worked hard to create a life I’m proud of. Knowing what you know now about life/business, what would you tell your 16-year-old self? You don’t need to settle. Your dreams are your reality. Just go for it!! What is your most proud success? Personal or professional? Creating a life where I get to actively live my dreams each day. It’s pretty surreal. What are some of your ongoing or current projects that we can follow? I collaborate with other creative entrepreneurs, like my recent bridal shoot! 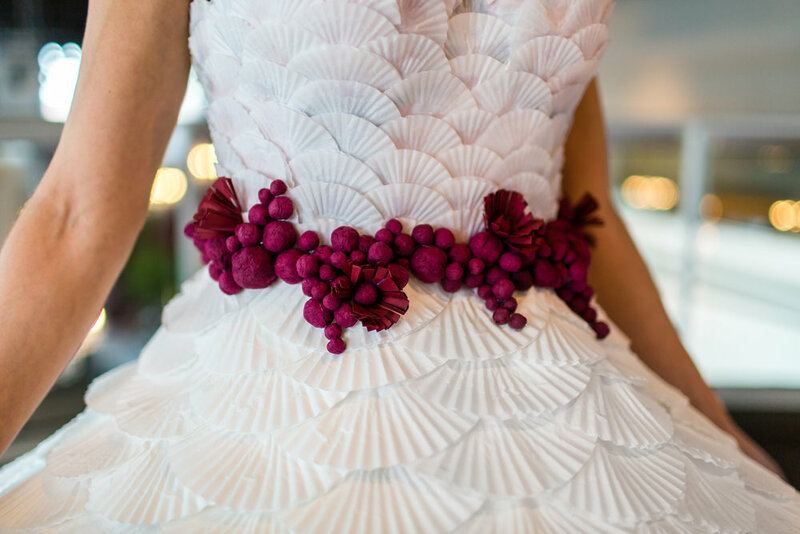 We had about 10 women participate, and I got to wear and be photographed in a wedding dress that was made almost entirely of cupcake liners. Yeah, cupcake liners. It was pretty awesome. I also host in-person events and a podcast to give women tools, resources, and perspective to help them take leaps in their personal and professional lives. So people can get on board by joining me wherever they see themselves! So you know that I love spotlighting Wonder Women in the Twin Cities, which you ARE one of course, so if you could have any superpower, what would that be? Strong intuition. I believe that developing my intuition opens up gifts like clairvoyance, so I enjoy getting in tune. As a busy Mom, wifey, entrepreneur, community supporter, Air bnb host….all the hats you wear - what does "me time"or self care look like for you? What is one (or more) empowering quote you love? “This day will never come again.” It reminds me to make the most of each moment and find the beauty in each day! If you see an event you’d love to attend - join us! If you have any creative projects you’d love to collaborate on - reach out! If you know someone I should feature on my platform - let me know! A few other Dana "Fun Facts"
She was afraid to dance in public (and even in private) until a few years ago! She had her man have know each other since 1999 & have together since 2008.